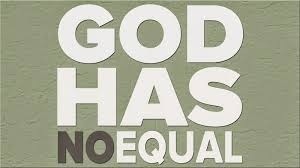 WHO IS EQUAL TO GOD?! Who is so learned to advise the Spirit of God? Who knows the weight of the earth and that of heaven? Who is so careful enough to know what lies beneath the earth? Who is so skilled enough to give breath to its creation? Who was present before the world began? Who sees the end of time from the beginning? and the one yet unknown to the man? Who is so loving that he can sacrifice the life of his only child in place of another? Who sees the beginning and the end of the ocean at once? Look up to the heavens and see the glory of MY GOD! He calls the stars by name, and they match up to their positions like armies going into battle. Who is bigger than him? Indeed, My God has no equal!